The design competition Formula Student Electric is regarded as a proving ground for future engineers of electromobility. 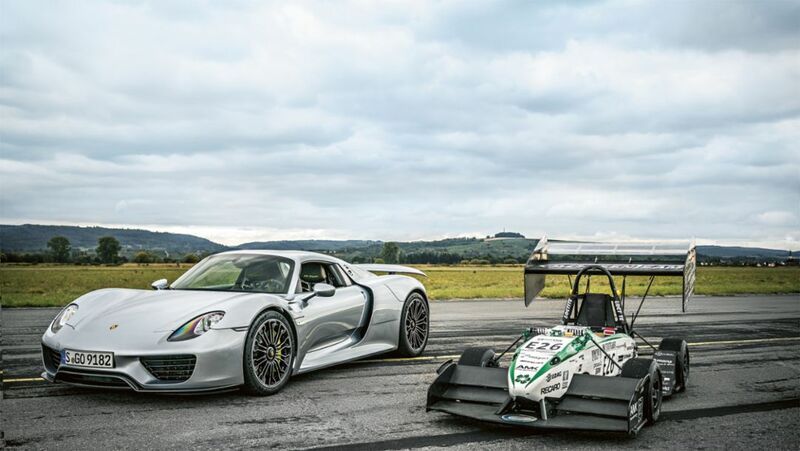 Porsche Engineering supports the GreenTeam from the University of Stuttgart in the development of electric race cars. Michael Steiner, Member of the Executive Board — research and development — at Porsche AG, and Malte Radmann, General Manager of Porsche Engineering, talking about the future of sports car development and innovative engineering services. Porsche will remain title sponsor of the European Tour event in Germany until 2020. Besides, the venue for the third edition of the Porsche European Open has been announced. In a topicly focused partnership with SpinLab, the accelerator programme of the HHL Leipzig Graduate School of Management, Porsche enables young scientists to work on their own ideas, developing them until they are ready to be marketed. Daddylicious: Family expert Kai Bösel gave the new Porsche Panamera a thorough examination. A sportscar as a family car – is that even possible? Germany's most well-known parent bloggers have now tested the new Porsche Panamera and discovered their own “Work-Drive Balance” in the process. Innovative joint technologies, multi-material mix and large-scale use of aluminium: The new body shop at the Porsche plant in Leipzig is one of the most modern and innovative facilities of its kind in the automotive industry.